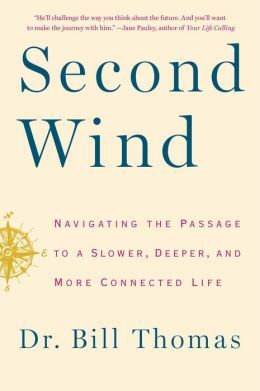 I mentioned thought-leader/geriatrician Bill Thomas’ book Second Wind: Navigating the Passage to a Slower, Deeper, and More Connected Life in a post earlier this month about “Bedside Books.” I’m ready to share a more complete review. His basic premise is that the dynamics that gave rise to the Baby Boomers (back when the phrase referred to youth) have over the intervening 40 years created a dangerous sea of misperceptions about old age. He calls for a cultural revolution mirroring that of the 1960s to reinvent elderhood as radically as we once challenged existing ideas of adulthood. Young people of the era were ultimately led to choose among three basic developmental strategies for emerging out of childhood. They could (1) accept adulthood as it was lived by one’s parents, (2) embrace the power of adulthood as an instrument of social change, or (3) reject the adulthood on offer and explore new, nonadult ways of living beyond childhood. The chaos associated with the most intense First Crucible years generated a powerful counter-counterculture….The Squares’ furious rejection of the First Crucible’s social and cultural dislocations led them to push their counterreformation forward with relentless energy and dedication. In the second section, titled “The Rise to Power,” Dr. Thomas takes down “The Cult of Adulthood” with astounding vigor. Steven Covey-style efficiency? Dangerous brainwashing to make us all productive cogs in their great machine. Greed? Our national religion, masked as Horatio Alger-style “rags to respectability” bootstrapping. Time is money, and it’s moving faster than ever, thanks to the sensation of drowning in an unending stream of news, opinions, facts, and statistics. The postwar generation’s increasingly strained relationship with adulthood will create entirely new cultural fault lines. During the Second Crucible, these fractures will give rise to unique subcultures with divergent answers to the increasingly urgent question, “What comes next?” Members of the postwar generation will deny the necessity of change and endeavor to remain fully and permanently adult, accept but work to minimize the impact of change for as long as possible, or embrace change and choose to explore life beyond adulthood. Like the Squares, Activists, and Hippies, these three reactions “are poised to exert an outsize influence over our shared culture.” The rest of Thomas’ Second Wind is devoted to his call to action–that we join his Enthusiasts and fight for respect and appreciation for this developmental stage in which we privilege being over doing (take THAT, efficiency-worshipers!). It’s time to embrace and share the gifts of sages and crones–wisdom, insight, experience, common sense. “It’s time to challenge the dehumanizing power of ageism,” Thomas writes. Reading Second Wind came for me a few months after finishing Powers of the Weak, a seminal feminist text published in 1980 by Elizabeth Janeway. 1+1 = 11 when you realize who the “weak” are in this next cultural revolution–the elders, rendered invisible and dehumanized by ageism! Let’s get this revolution underway, Baby Boomers! We’ve changed every institution we’ve touched since kindergarten–do you really want to stop now? This entry was posted in Book review, Call for action. Bookmark the permalink.